The V8-engined Bullet is unleashed on Targa Tasmania! 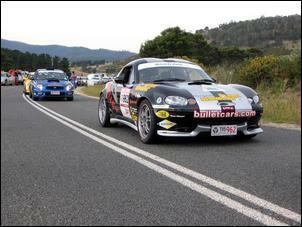 Targa Tasmania - the ultimate test for a production vehicle! It's one thing to build a supercar for the street but quite another to test its mettle in competition. Especially when that competition is the car-eating event called Targa Tasmania! Tom Rabold, co-owner of Bullet Cars Australia, decided to enter one of his Lexus V8 powered beasties as the ultimate test of handling, performance and reliability. If there were any shortcomings, Tom wanted to know about them. 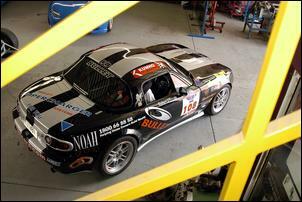 The Gold Coast team began assembly of the dedicated competition machine in mid-late ’04 with the intention of entering the Bathurst 24 hour race. You can imagine Tom's frustration when the event was cancelled. But with the car well under way, Tom channeled his energy into finding a replacement event – and Targa Tasmania was the obvious choice. The only problem was there was minimal time to prepare, so the team burnt the midnight oil building the car and squeezing in 20 laps around a local track before heading south. 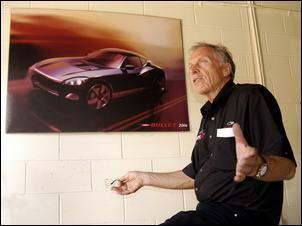 “The car we built is, with very few exceptions, what a customer can buy from Bullet Cars,” says Tom. Like all Bullets, the Targa car is built on a space-frame chassis combined with a Mazda MX-5 ‘tub’. However, being built as a competition car, the opportunity was taken to integrate the CAMS-spec roll cage with the frame. This achieves a neater result than fitting a cage to a pre-built car. The Bullet flies on MacPherson front struts and a double wishbone rear. Everything remains as you’ll find in a conventional Bullet except there are double adjustable Koni dampers and firmer front springs. Interestingly, it was also discovered that the Bullet showed better handling by disconnecting the rear swaybar (a change which Tom is passing on to many Bullet owners). 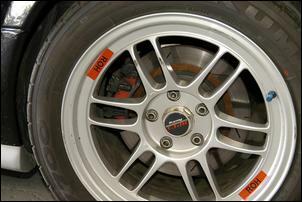 Tom rightly predicted that Targa is tough on brakes so he specified the optional Bullet SS brake package. The SS brake package comprises Brembo 4-pot front calipers with 330mm discs and RX-7 single-pot rears with 294mm discs. 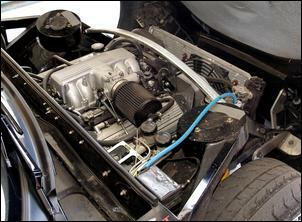 The Targa car was also equipped with braided lines and a dual circuit master cylinder with in-car adjustable bias. The vacuum booster was also deleted. Tilt the nose forward and you’ll see a Toyota/Lexus 1UZ-FE 4-litre quad-cam V8. The engine is factory rated at 194kW but you can expect a fair amount extra given a high-flow twin 2 ½ inch exhaust, K&N filter (mounted directly on the throttle body) and Bullet spec upgrade camshafts. Controlling fuel and ignition is an Autronic programmable ECU which, for this application, is tuned for Elf race fuel. The radiator and lubrication systems remain standard for the purpose of testing the off-the-showroom package. The 1UZ is always factory fitted to an automatic transmission but the Bullet ties it to a Supra manual ‘box. Tom says this was one of the elements of the Bullet he was keen to test in motorsport. The clutch assembly is unchanged from standard Bullet spec - the only driveline alteration is a slightly tighter LSD. The body of the Targa car is the standard Bullet hardtop which uses a combination of fiberglass, Kevlar and carbon fibre panels. There were no spoilers added for the event and Tom points out they’ve never really done much in terms of under-car airflow development. This will be something that’s addressed in future models. Standard size lightweight rims were bolted on in conjunction with Kuhmo street-legal slicks measuring 235/40 17 at the front and a huge 275/40 17 at the rear. Tom says this is definitely the biggest you can squeeze in. Final preparations included fitting race seats, a dished rally-style steering wheel and harnesses to the otherwise standard interior. Unfortunately, in the first day of competition it was realised that the driver’s seat and steering wheel were mounted too close to let the enlisted driver – former Bullet engineer, Robert D’Ercole – do his thing. (Robert has raced in the UK and US and knows how to extract speed from the Bullet.) Making matters worse were the near-useless brand of brake pads. During the following four days of Targa, the Bullet hauled itself up from 45th to 24th outright despite treacherous wet conditions that saw even AWD machines spear off the road. Finishing 24th in a field of 250 cars is no small achievement and everyone in the Bullet camp recognises the potential for an even better ranking with the car set up properly from Day One and with more favourable weather. But nobody from Bullet will be pursuing that. They achieved everything the set out to – they threw their machine into competition and it performed faultlessly even when pushed to its limit. We can only wait to see what the all-new replacement Bullet will be like! AutoSpeed was kindly handed the keys to the Targa spec Bullet. On a brief drive in the vicinity of the Bullet factory we were impressed by the flexibility of its performance – the combination of V8 grunt in a lightweight body is an awesome package. The cam’d 1UZ offers a very linear power delivery and it’s damn quick when kept on the boil. The steering is quick without being nervous and the suspension taut but not solid. The brakes feel strong after a couple of applications but, certainly, you need to be aware there’s no brake booster. 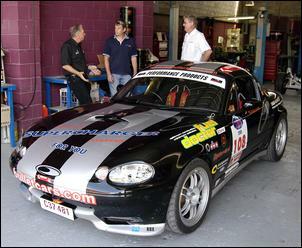 Unfortunately, we were unable to really test the car due to the very cramped driving position (we could barely get in!) but we get a seat-of-the-pants understanding how the car managed its competitive stage times.